Click here for a full-size printable version of the Campground Site Map. 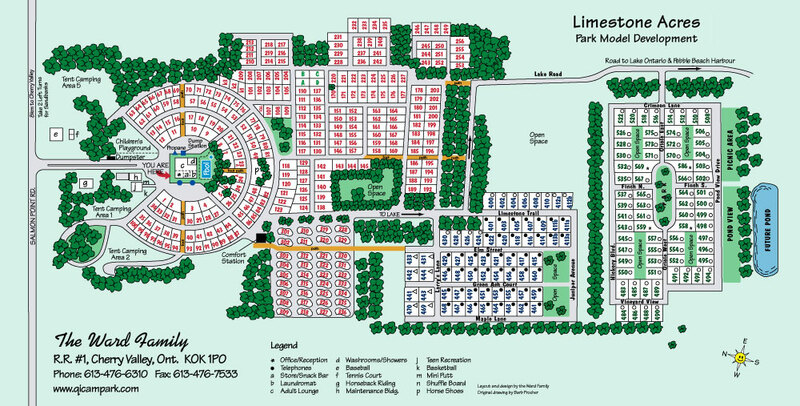 Limestone Acres is an exclusive park model section of our Double 5 Star Park which features recreational access, exceptional large sites, and the laid back lifestyle of Prince Edward County. Just imagine spending the morning golfing, the afternoon strolling along the pristine Sandbanks Beach and the evening in one of the many quaint local restaurants and wineries. Limestone Acres is located in the heart of our one thousand acre resort property with vast open vistas; old growth maple sugar bush; and over a mile of waterfront along Lake Ontario. Our turn-key Northlander packages are easy to purchase and maintain. This will offer you the highest possible quality at an affordable price. Ease of ownership is what we offer. All of our Northlander Park Models will be situated on large landscaped sites with a gravel driveway and lighted street post. Delivery and installation is performed by our factory trained construction team on a cement pad. This is just the beginning - also included in our package is a vinyl sided garden shed on a cement pad. Please contact Steve or Tim Ward to find out how you can reserve your site now. Pebble Beach East "camping at the lake" is an exciting area where our new Pebble Beach harbour and 1 mile of Lake Ontario waterfront is located. This is a rustic area of camping with spectacular views of Lake Ontario. This area is ideally suited for the campers looking for nature. You can camp facing the water or tucked away in the treed cul-de-sacs on large lots. As of July 1, 2015 there are 58 pull thru campsites, with 50,30,20 amp electrical, water and sewer service at each site. Pebble Beach West "cottages at the lake" features 1,2 and 3 bedroom Cottage and Deck Packages. Click here for a full-size printable version of the Pebble Beach Site Map. Quinte's Isle Campark invites you to enjoy our 5 STAR rated campground.